A calibrator is an equipment used to adjust an instrument accuracy, often associated with a specific application. The most sophisticated industrial equipment will not be very useful unless it is calibrated. Through calibration, adjustments made to a piece of equipment ensure that it performs as expected—that it can be relied on to deliver predictable, accurate results that meet quality standards. Simply defined, calibration is the process of adjusting a device to meet manufacturer’s specifications. Calibration is sometimes also defined as the issuing of data, including a report or certificate of calibration, that assures an end user of a product’s conformance with specifications, and perhaps also with external guidelines, such as those of the International Organization for Standardization, whose ISO 9001 standards, for example, set worldwide specifications for business sectors. A company follows these standards to ensure that its products and/or services gain acceptance among suppliers and customers. This second definition of calibration is more properly referred to as certification. Most instruments and sensors are designed to meet certain accuracy specifications; the process of adjusting an instrument to meet those specifications is referred to as calibration. The device used to calibrate other instruments is known as a calibrator. Calibrators vary in form and function depending on the instruments with which they are designed to work. 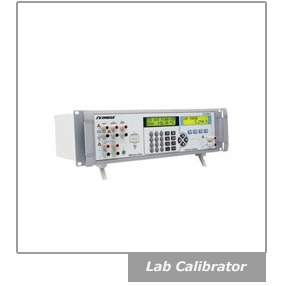 OMEGA Engineering offers a wide range of calibrators in Australia. The National Institute of Standards and Technology (NIST), part of the U.S. Department of Commerce, oversees the development of measurement standards and technology consistent with the International System of Units (SI). NIST is also charged with imparting these standards to the American system of measurements through calibrations and other services. To help U.S. industry meet international standards, NIST provides, among other programs, laboratory accreditation that enables a business to establish traceability of measurement results. A company with equipment needing calibration may send it to a metrology/calibration laboratory, where a skilled technician will either bring it up to specifications or confirm that it already meets them, using measurement/test instruments that must themselves meet strict calibration requirements. All or part of the components used in an industrial process can be calibrated. A temperature calibration, for example, could involve a probe alone, an instrument alone, or a probe connected to an instrument (a system calibration). Adjustments made during calibration must fall within certain tolerances. Such tolerances represent very small, acceptable deviations from the equipment’s specified accuracy. How often should an instrument be calibrated? The manufacturer usually does the initial calibration on its equipment. Subsequent calibrations may be done in-house, by a third-party lab, or by the manufacturer. The frequency of recalibration will vary with the type of equipment. Deciding when to recalibrate a flowmeter, for example, depends mainly on how well the meter performs in the application. If liquids passing through the flowmeter are abrasive or corrosive, parts of the meter may deteriorate in a very short time. Under favorable conditions, the same flowmeter might last for years without requiring recalibration. As a rule, however, recalibration should be performed at least once a year. Of course, in critical applications frequency will be much greater. What Is Involved in a Typical Calibration? A weighing system serves well in illustrating general principles of calibration. Archimedes and Leonardo Da Vinci used the positioning of calibrated counterweights on a mechanical lever to balance and thereby determine unknown weights. A variation of this device uses multiple levers, each of a different length and balanced with a single standard weight. Later, calibrated springs replaced standard weights. The introduction of hydraulic and electronic (strain gage-based) load cells represented the first major design change in weighing technology. In today’s processing plants, electronic load cells are preferred in most applications. To check if transducers and load cells are functioning properly, the user must answer the following: Does the weight indication return to zero when the system is empty or unloaded? Does the indicated weight double when the weight doubles? Does the indicated weight remain the same when the location of the load changes (uneven loading)? If the answers are yes, the cells and transducers are probably in good condition. A black body is used for calibrating infrared pyrometers. They typically consist of a target plate that has a very high emisivity. The temperature of the target plate can be controlled to very tight tolerances. To calibrate and infrared pyrometer, the pyrometer makes a measurement of the the target plate. The controlled temperature of the plate is compared with the pyrometer reading. The pyrometer is then adjusted until the the difference is minimal. The high emissivity of the target plate minimizes emissivity errors. Block Calibrators are used for calibrating temperature probes. They contain a metal block that can be heated to a precise temperature. Temperature probes can be inserted into the block and the measured temperature of the probes can be compared with the controlled temperature of the blocks. Since temperature probes generally don't have any adjustments, this is really verification process rather than a true calibration. When calibrating an instrument, such as a panel meter or temperature controller, it is necessary to input a precise known electrical signal. The instrument's display or output value can then be adjusted to match the input signal. a signal reference is used to generate the precision signal. Signal references are available as voltage references, current references and frequency references. When working with an instrument that reads a sensor, such as thermocouple, a special type of signal reference, called a simulator is used. The simulator can accurately reproduce a sensor output. Many signal references and simulators can not only generate signals but read them as well. Triaxial accelerometers measure the vibration in three axes X, Y and Z. They have three crystals positioned so that each one reacts to vibration in a different axis. The output has three signals, each representing the vibration for one of the three axes. The ACC301 has lightweight titanium construction and 10 mV/g output with a dynamic range of +/-500 g's over a range of 3 to 10 kHz. ice point™ calibration reference chambers employ thermoelectric cooling elements to produce a very precise stable 0°C reference chamber. The reference chamber can be used for calibrating temperature probes but they are also commonly used in simulating a thermocouple signal for the calibration and verification of instruments that read thermocouples. The OMEGA Engineering Singapore office handles all inquiries and orders for Australia. We have Application Engineers and Sale Support Staff ready to assist you with your technical questions, quotations and orders. A one-stop source for process measurement and control, OMEGA provides support through web chat, e-mail and telephone. View our contact page to call or email us.